Wearing a cape is a curious thing. It’s about the simplest piece of apparel imaginable, just a sheet of fabric that attaches around the shoulders. A cape can serve some purpose, mainly as a wearable blanket or added protection against the weather, but often as not it’s mostly for show. And yet a cape can also be one of the most versatile items in a wardrobe, depending on what you pair it with and what you choose to do while wearing it. Think about it: wear a black cape along with a tuxedo and you’re instantly recognizable as a magician. Wear a gilt-trimmed cape along with a crown and there’s no question you’re royalty. Wear a brightly colored cape along with a matching, tight-fitting outfit and everyone will peg you as a superhero. Wear even a modest cape with your every everyday work clothes and you’re automatically “that weirdo who wears a cape to work.” Wear a fur-lined cape over your hand-welded armor and battle gear and you’re declaring to the world that you’re a warrior who doesn’t fear a chilly night. 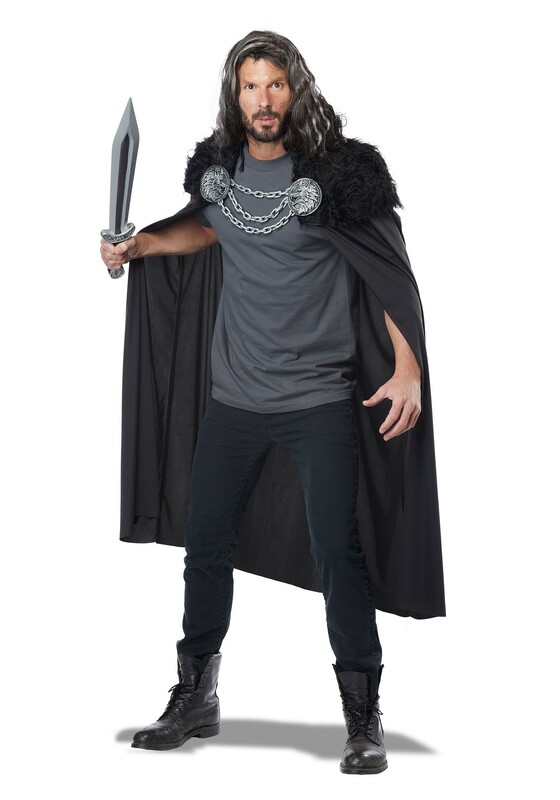 Get out there and run with the wolves in this flowing, polyester warrior cape, featuring a wide, faux fur collar held in place with tough-looking vinyl chains. Look closely at the twin chest medallions and you’ll see they’re emblazoned with ferocious wolf images, just the thing for telling rival clans that you’re not one to be tangled with. There’s no such thing as a cape that doesn’t make a statement, and this statement speaks louder than most.